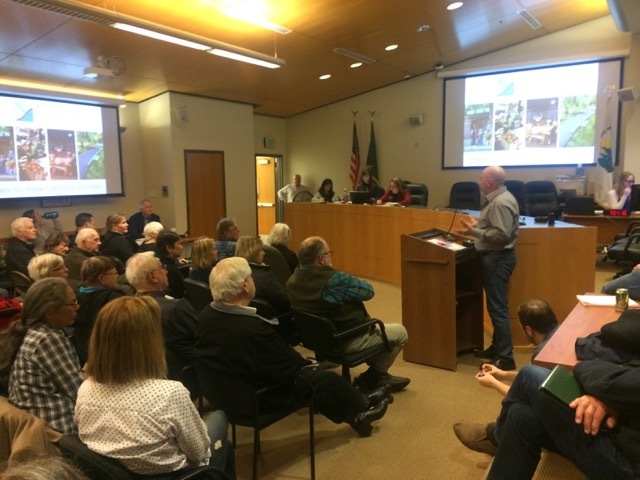 The City of Lake Forest Park’s Planning Department and the Otak design firm held a hearing on January 16, 2019 for public comment on the Draft Environmental Impact Statement (DEIS) for Town Center. 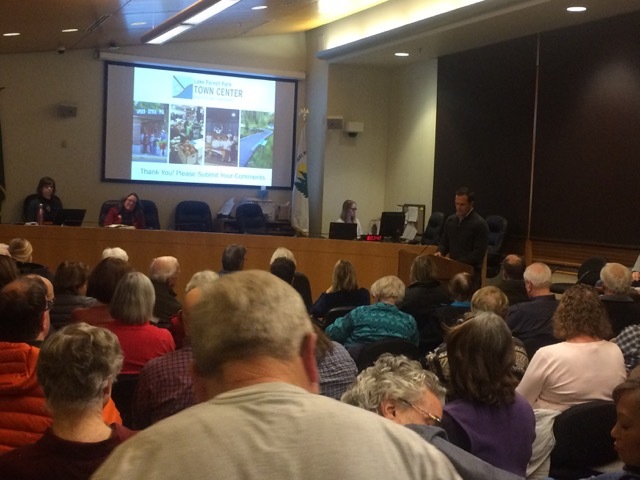 City Hall saw an overflow crowd of residents at the meeting, with many concerns. Sound Transit plans to add a park n’ ride facility and Bus Rapid Transit at Town Center, so a DEIS is needed now to study the potential environmental impact of proposed changes to land use codes. Since the Town Center has not been renovated in years, and the LFP community has expressed interest in redevelopment per a 2004 task force report, this also initiated further redevelopment exploration. However, density considerations in the 2004 report stated a possible 270 maximum units. Today with unprecedented regional growth, that figure has climbed to possibly 1,500 multi-usage units. 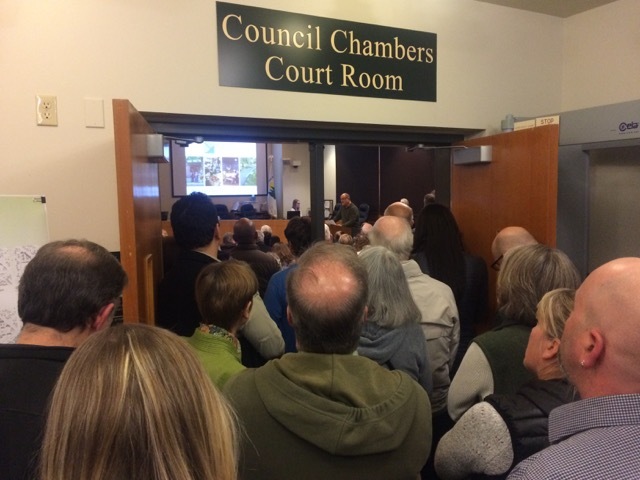 Property owners Merlone Geier, the City Council, City staff and outside consultants such as Otak are being pushed hard by Sound Transit’s aggressive plan deadline. It creates a “chicken before the egg” type of dilemma. At the DEIS hearing, Jamas Gwilliam, Merlone Geier Vice-President of Development, said they have enjoyed all the community input so far, and look forward to continued discussions. But, he said, there is currently “no plan for Merlone Geier to redevelop” the site. He said they would make that determination “after” they see what decisions the City and Sound Transit make. Redevelopment scenarios that represented higher density numbers than residents even thought possible created outrage. Those that were involved with the process, such a representative from the LFP Planning Commission (composed of citizens) said he felt “deceived” in regard to projected density numbers. Residents also stated shock and dismay over the idea of relocating the Third Place Commons on the top of the park n’ ride facility. Lake Forest Park residents don’t feel heard. Because of the ST3 deadline for their planned project, an intricate weave of decision making is needed quickly, and that creates an awkward process. This can create communication breakdowns and misunderstandings. Current Town Center regulations allow buildings as high as 65 feet tall. That too was a surprise to many residents. Concept boards with broad design scenarios were presented in October. Some expressed that they did not see specific density details. The scenarios don’t include many specifics because the goal is to design as much flexibility into a future planning process as possible. Due to long term rental contracts with Albertson’s and Ross Dress for Less organizations, as well as other business considerations, estimates are that it could be up to 20 years before redevelopment can take place. Leases can be purchased as an incentive, but that is costly. Also, business representatives have expressed concerns about a substantial construction disruption. Uncertainty within the retail sector is another factor. Housing predictions remain steady, according to regional growth estimates. But the cost of labor and materials continues to rise. Indeed, a lot more changes and unknowns will occur in the next one or two decades. Commons on the roof of the parking facility. In October, one resident stated: “It seems the 'Big Bully Sound Transit' is making all the rules now." That was the same tone at the DEIS hearing. Sound Transit has not determined the final location for the 300 stall park n’ ride, yet the city is expected to modify building codes by the end of February and complete a DEIS in record time. One suggestion was to modify only the codes necessary to accommodate the park n’ ride facility. Citizens with professional qualifications gave opinions that the DEIS is outrageous in its assumptions and should be thrown out and the entire document recreated. She explained that their family is caring for an aging grandfather. Her 20 year-old son is a helping caregiver, but they live in a small home. Two other sons would like to live in LFP and be nearby their family; however they need to be in walking distance of public transit services, and they can’t afford single-family housing here. Without alternatives to housing, generations of LFP families may not be able to continue their linkage and remain close to aging families and their friends, and that too saddens many residents. It’s inevitable that some future development will take place at Town Center, but the extreme deadline is also pitting neighborhoods against each other. Sound Transit has imposed deadlines that seem nearly impossible for a process that usually takes several years to accomplish. A lot is at stake here. Mistakes could occur, and LFP taxpayers could bear the brunt of added financial burdens, as well as environmental strains and permanent damage if planning is not carefully done. The City Staff is small for the workload, and City-wide communications are minimal. If this DEIS proceeds as scheduled, the citizen’s LFP Planning Commission said they would not have time to comment on code modifications before the City Council fully votes. 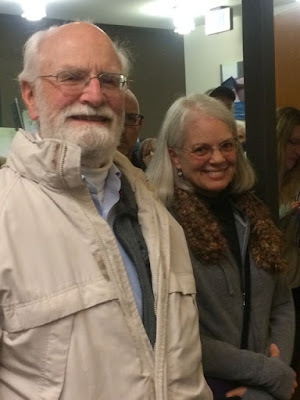 An LFP Planning Commission representative shared deep frustration by this process – it has been challenging for this dedicated group of volunteer citizens to do a great job on behalf of the residents, and that alarm was sounded loud and clear. clarified that they had no specific plans for redevelopment. Third Place Commons functions as an independent non-profit and has needs specific to their mission. Currently, scenarios show the Commons relocated to the roof of the parking garage. Residents shared concern that this will change the dynamics of what is considered the heart of the community today. Not only do our youth suffer from nature deficit, but we are all at risk for social deficit disorders. Technology has changed levels of human interaction opportunities, so the Commons today plays an integral part in the fabric of a healthy community. Residents wondered why no members of City Council nor anyone from Sound Transit attended the DEIS public hearing. At the end of the meeting, Mayor Jeff Johnson said that City Council has been working very hard for the citizens. He says that everyone is doing their best during this enormous challenge and thanked the residents for attending. Now all the LFP residents who showed up at the Shoreline city council meetings all pro-rezone developent are experiencing karma. It's not so nice when it's in your own neighborhood, hmmm? LFP Residents are at the crossroads of two major state highways. They had best come to terms with their progressive ideas about mass transit and density in urban environments. To the first commenter here it's pretty presumptuous to assume that the people that showed up to the Shoreline City council meeting are the same ones who are upset about the possible zoning charges in LFP!! I for one have been a resident of Shoreline AND now here in LFP for over 40yrs, and don't agree with any of the ridiculous zoning changes in EITHER city!!!! Instead of making snap judgements MAYBE you should speak with a majority of our residents before you go bashing them here on this public platform!! !